Low loft cotton batting measuring no less than 49" x 49"
Pre wash and press fabrics before cutting out pattern pieces. When cutting, use the cutting layout photos below as a guide. Always place right sides together when doing a seam. Always pin carefully in place to keep the pieces from shifting while sewing. Follow the seam allowance instructions below. Remove the pins as you come to them, do not sew over them. Press all seams according to the instructions below. Seam Allowance is 1/4" unless otherwise noted. Press all seams in each section and in the joining of sections toward the black fabric square. When joining rows together, press all seams in the same direction each time. Chess Board Quilt Measures 49" x 49" upon completion. Before cutting out any squares on your fabric, cut out pieces for the back and binding as shown in the cutting layout photos. Cut your pieces out according the the following dimensions. Gold/Tan fabric: One piece, 49" x 18"; Two pieces, 49" x 16.5"; 32 pieces, 6.5" x 6.5". Black fabric: Four pieces, 50" x 2.5"; 32 pieces, 6.5" x 6.5". To cut out the squares, lay the fabric out on your cutting table with the wrong side up. Carefully draw lines around the pattern template edges with the quilter's pencil. Draw a straight line inside each fabric square in the direction of the lengthwise grain. Cut pieces out very carefully for best results. Press the completed Chess Board Top again if needed. 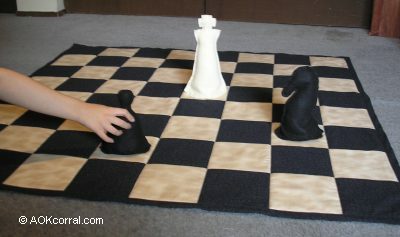 The seam allowance for the back of the chess board is 1/2 inch. Pin one of the 49" x 16.5" pieces to the 49" x 18" piece, wrong sides together and along the 49" edge. Stitch, remove pins and press all seam allowances in one direction. Next, pin the other long edge of the 49" x 18" piece to the other 49" x 16.5" piece, wrong sides together. Prepare the batting by pressing out any deep wrinkles and folds so that it lies flat and then cutting out a piece measuring 49" x 49". Lay the batting out on your cutting board. Lay the Chess Board Back over the batting with the right side facing up toward you and the wrong side against the batting. Adjust the back so that it is centered on the batting and smooth it out. Place pins about every 12 inches around the outside edge through both the batting and the back piece to hold them in position together. Flip the quilt back with batting over so that the other side of the batting is facing up and flatten out on your cutting table. Lay the Chess Board Top over the batting with its right side facing up toward you and the wrong side against the batting. Place pins about every 6 inches around the edges of the quilt top through all thickness. Remove the pins used to secure the back to the batting since you now have pins on the top through all thickness. Place pins along both sides of the center stitch line running side to side on your chess board top. Using your gold/tan thread in your sewing machine and starting from the center, sew along the center stitch line as close to the stitched line as possible to the edge. Turn around and do the other side from the center to the edge. Now lay your quilt out on the cutting board again. Take the pins out around that stitched line and place them along both sides of the next stitch line (either side) running up and down on your chess board top. As you did on the center line, sew along the stitched line each time starting from the center and working toward the edges. Remove all pins except those holding the corners and a few along the edge. Press out any wrinkles if needed. With right side of quilt facing up, trim off excess batting as backing fabric along top quilt edge. Lay the quilt out on your cutting board face up. Take two of the binding strips and fold each one in half, wrong sides together and press. Open one of the binding strips. Center the binding strip along one edge of the quilt with right sides together and raw edges even. Pin the binding in place and then sew (1/4 inch seam allowance). Turn the binding up along the seam and press the seam. Now, fold the binding over the raw edge of the quilt just until the 1/4" pressed fold just covers your seam line from sewing on the other edge of the binding. Pin the binding into place and edge stitch (1/8" from edge) through all thickness. Trim the ends of the binding that extend past the quilt edge so that they are even with the quilt edge. Repeat this same process for the opposite side of the quilt. To make the finishing bindings for the last two sides of the quilt you will follow the previous directions except that you will finish the short ends by folding them in and lining them up with the other sides. Take one of the last pieces of binding and fold in and press 1/2" on the short edge. Then, fold the binding strip in half wrong sides together and press. Pin the binding in place until you reach about 6" from the other end. Fold in the other short end of the binding as much as needed until the new folded edge lines up with the edge of the quilt, press and finished pinning in place. Continue to finish this binding strip as you did for the other two sides. Follow the same instructions for the last side of the quilt. This Chess Board Game is great for the Chess Enthusiast or For Anyone who wants to add a new element of fun to a Classic Game.